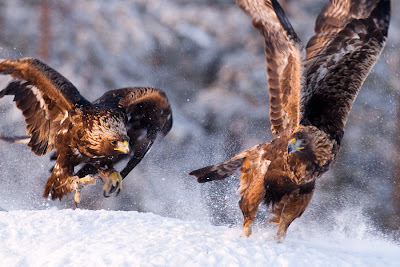 Golden eagles Aquila chrysaetos, photographed by Matti Rekilä. Aquila is a genus of large eagles found in Eurasia, Africa, North America and Australia. Characters (from Worthy & Holdaway 2002): Caudal margin of proc maxillare os nasale notched to receive rostral angle of os lacrimale; spina externa broader than deep; ilio-ischiadic foramen oval.